Lizzy Crist, a biomedical engineering graduate and former women’s soccer standout at Washington University in St. Louis, was named the 2017 NCAA Woman of the Year at a dinner in Indianapolis on Sunday. The Woman of the Year Award, created in 1991, recognizes graduating female student-athletes who have distinguished themselves in athletics, academics, leadership and community service. Crist is the second Washington U. in St. Louis woman to receive the award in its 27-year history, joining Elizabeth Phillips, who won in 2012. Crist also is the second soccer player and fifth Division III student-athlete to receive the award. Crist’s steadiness and reliability in goal helped carry her team to an NCAA national championship in 2016 and three conference championships. She is the 2017 recipient of the Division III Honda Athlete of the Year Award, given to the nation’s top female athlete in the division. 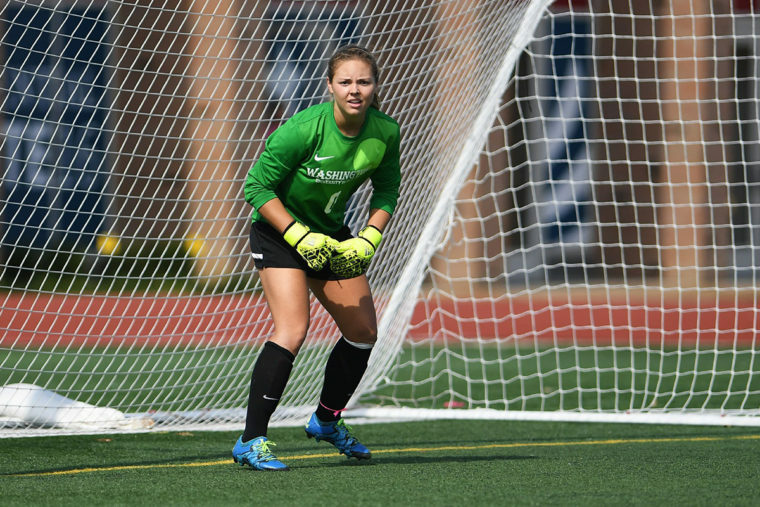 Crist was named the D3soccer.com Goalkeeper of the Year in two consecutive years, and in 2016 was named the National Player of the Year by the National Soccer Coaches Association of America. Crist also is a two-time NCAA Most Outstanding Defensive Player for her performances in Division III national championships. She holds school records for single-season shutouts (13) and all-time shutouts (31), and she tied the school record for total wins in a single season (19). “As much as I appreciate all the honors that I’ve been given, I really want to emphasize that it would not have been without the 10 women on the field with me at any given moment,” Crist said. Her successes were not limited to the soccer pitch. Crist graduated with a 3.9 GPA. In 2016, she was named the NSCAA Scholar Player of the Year. Crist is a three-time University Athletic Association Academic All-Conference Team honoree, and in 2017, she received the Outstanding Senior Biomedical Engineering Achievement Award and the Ethan A.H. Shepley Award, in recognition of leadership, scholarship and community service. Crist already is making her mark in the field of biomedical studies. She has co-authored a paper published in Scientific Reports research journal with findings contributing to understanding how malignant tumors grow blood vessels. She is now working toward a doctorate in biomedical engineering at Minnesota. “I have discovered a career where I can pursue research and make an impact on patient well-being and specifically cancer, but also return and give back to students and really try to help females go into those male-dominated careers and not ever feel like there’s a barrier based on their gender,” Crist said. Crist, who describes teaching as a tool she employed to empower women with knowledge and confidence, channeled her enthusiasm for engineering and learning into helping others pursue similar dreams. Throughout her time in college, she volunteered as an experiment leader for Einstein Explorers, which is a student organization that demonstrates science experiments for patients at Children’s Hospital in St. Louis. Crist also devoted time to tutoring, including fellow engineering students and elementary-level English and math students, and volunteered to coach first-grade girls at the Christ the King Soccer Clinic. In 2017, in recognition of her efforts on and off the field, Crist received the W. Alfred Hayes Award, given to athletes who provided constructive leadership at the university. The NCAA Woman of the Year Selection Committee chose the nine finalists from the Top 30 national honorees. From the nine finalists, the NCAA Committee on Women’s Athletics, composed of representatives from NCAA schools and conferences, selected Crist as this year’s NCAA Woman of the Year. The event Sunday in Indianapolis celebrated the Top 30 honorees, who had been selected from a pool of 145 conference nominees. To be eligible for the award, a female student-athlete must have completed eligibility in her primary sport by the end of the 2017 spring season, graduated no later than the end of the summer 2017 term and achieved a minimum cumulative GPA of 2.5. Last year’s NCAA Woman of the Year was Margaret Guo, a swimmer from MIT.